Cabin Passenger List from the SS St. Paul of the American Line, Departing 15 July 1911 from Southampton to New York via Cherbourg, Commanded by Captain F. M. Passow. Uberti, Mr Giovanni di H.
BREAKFAST from 8 until 10 a.m. LUNCHEON, 1 p.m. DINNER, 7 p.m. The Bar closes at 11.30 p.m. Lights are extinguished in the saloon at 11 p.m., and In the Smoking Room at 12 (midnight). Please apply to the Second Steward for Seats at Table. Meals for Children are served separately. 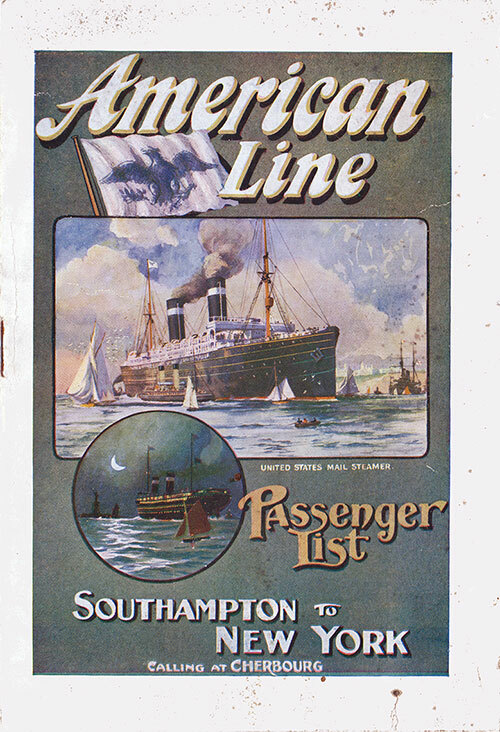 Letters and Telegrams should be handed to the Saloon Steward within an hour after leaving Southampton, and those for despatch upon reaching port should be handed to him an hour before arrival. Writing Paper, Envelopes, and Telegraph Forms will be found in the Library. For Railway and Steamship Time Tables of the various Companies, apply to the Saloon Steward. Inquiries regarding Baggage will be attended to by the Baggage Steward, to whom all Baggage which passengers wisn to leave in the Company's care should be handed, properly labelled, and with full instructions as to disposal. Large Deck Chairs can be obtained for use on the voyage, at a charge of 4/- each, upon application to the Deck Steward. Rugs can also be hired on Board at a charge of 4/-. THE SURGEON is authorised to make customary charges, subject in each case to the approval of the Commander, for treating passengers at their request for any illness not originating on board the Ship. In the case of sickness developed on board no charge will be made, and medicine will be provided free in all circumstances. Should the Steamer arrive at the New York Wharf after 8 p.m., passengers may land if they wish to do so, and have their baggage passed by the Customs authorities immediately on arrival, but those who prefer to remain on board may do so, and have the whole of their baggage passed the following morning not earlier than 7 o'clock. Breakfast will be served to those who remain on board over night. VALUABLES. The American Line has provided a Safe in the office of the Purser in which Passengers may deposit Money, Jewels, or Ornaments for safe keeping. The Company will not be liable to Passengers for the loss of money, jewels, or ornaments, by theft or otherwise, not so deposited. INSURANCE OF BAGGAGE, &C- Arrangements have been made whereby passengers can have tneir baggage insured against loss by sea or land, including risk of fire, breakage, theft or pilferage, from the time the baggage is received by the American Line until delivery at destination. Other risks can also be insured against. The Company strongly recommend passengers to insure their packages whenever practicable, as in the event of loss or damage to baggage the American Line cannot under any circumstances accept any liability beyond the amount specified on their steamer contract ticket. TRAVELLERS' CHEQUES, payable in all parts of Europe, can be purchased at all the principal offices of the American Line. These Cheques are accepted on board American Line Steamers in payment of accounts, but the Pursers do not carry funds to enable them to cash same.